Upon first glance, it becomes apparent that Ford isn’t taking any chances with the 2010 Mustang. Don’t get us wrong, the fact that this car is more of an evolution than a revolution isn’t a bad thing. Unlike 2005’s facelift, which took the Mustang from its previous arrowhead shape to the more familiar retro look, the visual changes to the 2010 Mustang are more subtle – all the panels save the roof are new, yet the car looks like it has received a few nips and tucks rather than a comprehensive overhaul. Even the engine choices remain unchanged – 4.0-liter V-6, 4.6-liter V-8. What has changed, however, is the overall quality and value of the Mustang lineup. Interior fit and finish have been improved substantially, wheel sizes have increased by an inch across the board, advanced next-generation navigation is now available and road and wind noise have decreased. Best of all, Ford has boosted the standard GT’s performance by including equipment previously only available on the special edition Bullitt. Drivers and passengers alike will appreciate the Mustang’s improved interior materials and ergonomics, which now feel much less rental car spec. The addition new technologies such as Ford’s excellent next-generation navigation system and a rear-view camera give the Mustang some truly 21st century appeal. Enthusiasts will appreciate the Track Pack option. While we really like the front-end look of the new Mustang, the rear-end looks a bit, well, unfinished. The massive steering wheel still has a bit of slack in it and lacks detailed front-end feedback, though we are happy to say it’s a substantial improvement over the outgoing model. Use of a solid rear axle is well masked but continues to challenge modern industry standards, only becoming detrimental on particularly uneven surfaces. On the road, the 2010 Mustang feels downright civilized. While the GT has received the Bullitt’s stiffer suspension, it does a superb job of soaking up bumps while still managing to keep the car flat through corners. Road noise is surprisingly absent from the GT’s cabin, but the engine note won’t be missed thanks to a deviously clever tube that pumps V-8 induction noise directly into the cabin, taunting you to keep your foot in the throttle at all times. The steering remains a bit rubbery and slightly inaccurate on turn in, though it’s not a deal-breaker by any means. New to the GT is the Track Pack, a must-spec option for enthusiasts that adds the stability bars and lower control arms from the GT-500, performance brake pads, a 3.73 rear axle, 19-inch wheels with Pirelli summer tires and performance calibration for AdvanceTrac and ABS. It makes for a more dynamic GT package with a surprising amount of grip, though those keen for a bit of tail wagging will be happy to know that with stability control off, it breaks progressively and predictably. Base model Mustangs receive the same 4.0-liter V-6 engine featured in the previous Mustang, which produces 210 horsepower and 240 lb-ft of torque. That’s all fine if you’re running a rental car fleet, but a Mustang without a V-8 just doesn’t do it for us. The Mustang GT gets the same 4.6-liter V-8 as last year’s model, albeit with the cold-air intake from Bullitt, which boosts the small block’s output to 315 horsepower and 325 lb-ft of torque. Both engines drive the rear wheels through either a five-speed manual or automatic transmission. New to the Mustang options list is a full-length glass roof, giving the luxury convertible sunlight without all the soft-top fuss for a relatively reasonable $1,995. The ambient lighting system now boasts a feature known as MyColor, allowing drivers to set the color of the lighting in the gauge cluster, footwells, cup holders, doors and scuff plates to 125 different colors. It’s not the most useful of add-ons, but in a world of glow-stick colored iPods and custom mobile phone ringtones, we’re sure it will post disturbingly high sales figures. Ford’s next-generation navigation system – one of the best available today – comes as part of the Electronics Package for $2,195. It’s expensive, but with features such as live traffic, weather, gas prices and sports scores available while you’re on the road, we’d say it’s well worth it. Also offered on the Mustang for the first time is a reverse camera, though unlike most systems a delay can be dialed in so that it doesn’t shut off immediately once the car has shifted into a forward gear. This was presumably done for some safety mumbo-jumbo, but we’re not entirely sure – we spent our time watching our own burnouts. Official EPA numbers haven’t been released yet, but being as the powertrain options haven’t changed from last year, we don’t expect them to be drastically different (though the new car is slightly more aerodynamic). V-6 models should achieve roughly 17 mpg city, 26 mpg highway with a manual transmission and 16/24 highway with an automatic, with that figure decreasing slightly to 15/23 for V-8 manuals, 15/22 for V-8 automatics. While the exterior might retain some of the old car’s looks, inside the Mustang feels like an entirely new vehicle with its aluminum accents and soft-touch plastics. A particular highlight is the center console with its well-textured surfaces and clearly illuminated controls. The steering wheel remains imposing in its sheer size, though. On the front grille, Mustang aficionados will notice the first new Mustang pony since the car’s introduction 45 years ago. At the rear, half-inch larger exhaust pipes are topped by signature triple LED taillights that illuminate sequentially from the inside when the turn signals are activated. When the last Mustang was released, it was competing in an odd market with cars such as the Nissan 350Z, Mazda RX-8 and even the Mitsubishi Eclipse. Since then, however, Detroit has gone back into muscle car mode full swing. As such, the $27,995 Mustang GT is set to compete with the likes of the $29,820 Dodge Challenger R/T and the upcoming $30,995 Chevrolet Camaro SS, both of which outgun the Mustang in the horsepower department, as does the all-new $29,930 2009 Nissan 370Z. If the GT falls outside your budget, the V-6 Mustang starts at $20,995. As an overall package, the 2010 Mustang is a more refined vehicle than its predecessor. While some antiquated muscle car features remain (we’re looking at you, solid rear axle! 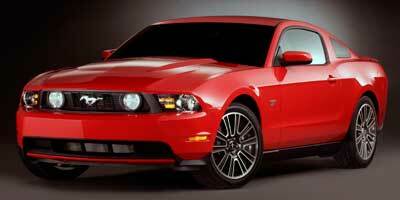 ), Ford has turned its pony car into more of a mainstream coupe, less of a stubborn American classic. In terms of raw engine power it might be bested by its domestic competitors, but at this price and with this engine note, you’d be hard-pressed to complain.